So the family christmas card has been handmade by us for over 20 years. Each year we must come up with something a little better and a little different. Yes there are expectations from those that receive them but it is also fun. Sometimes I get an idea, sometimes mum likes bits and pieces she has seen in my cardmaking magazines. Sometimes I need to do two designs as Dad decrees they are a bit cutesy for business use. After quite a bit of playing around test designs were provided to the family for approval. Yes its serious business! 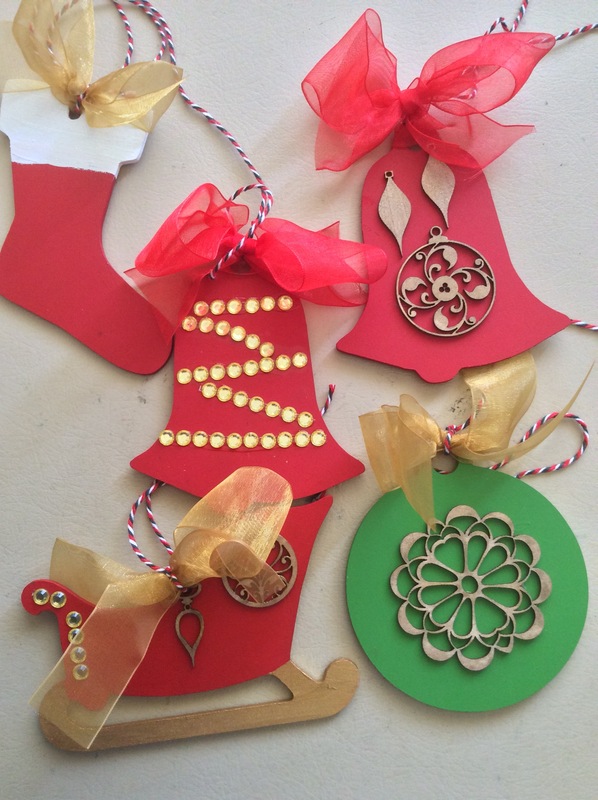 This year I was inspired by this tutorial on making a folded xmas tree from a half circle. Great I though, I can use the cricut to cut the circles. I was also keen to destash particularly brads. 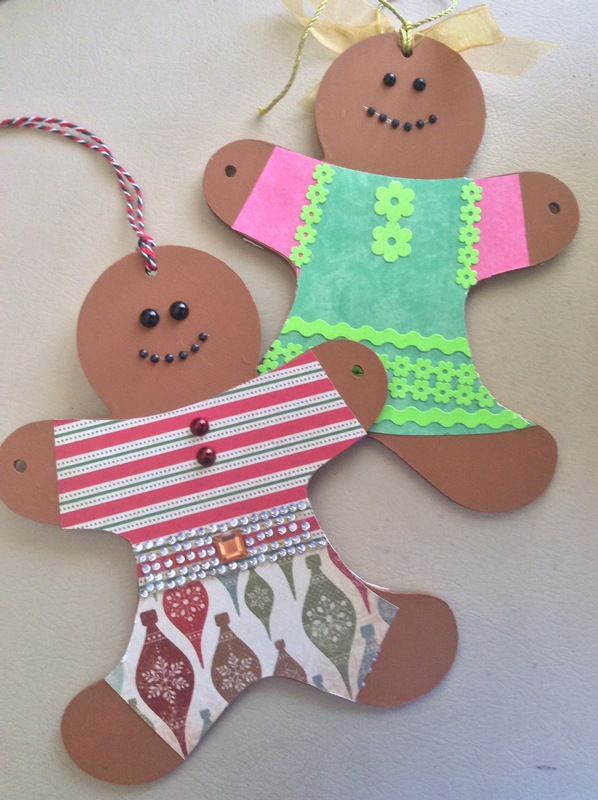 I did have to buy some xmas paper with smaller designs but I did economise by choosing a pad which worked for these and our gingerbreads plus the 12 days of xmas tags I still need to make. Usually I split up the construction tasks between myself and mum but as I am not working and she is, its all me. 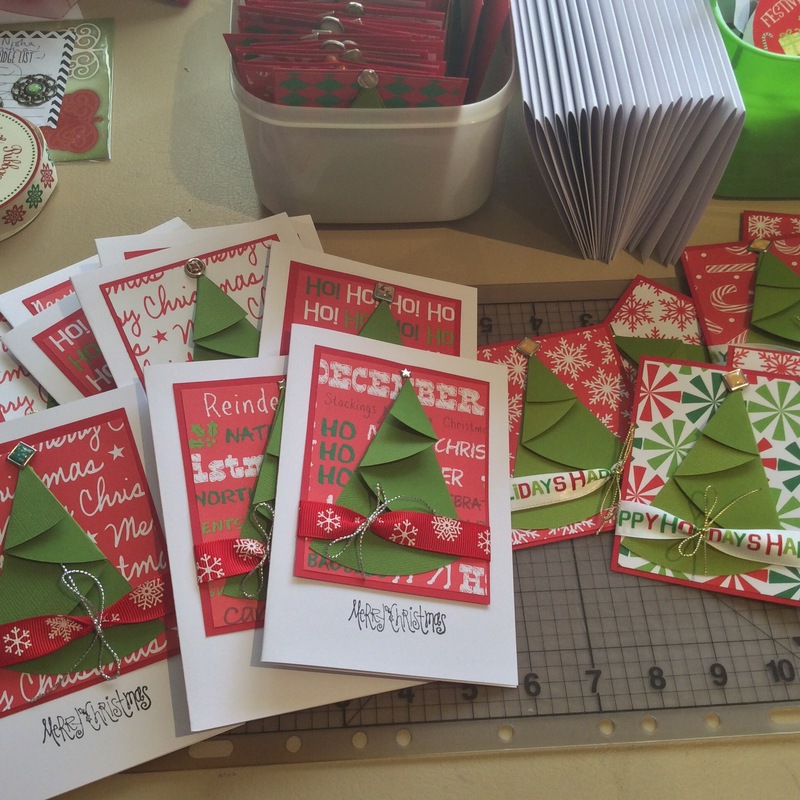 I have completed 1/4, 1/4 need some stamping, bases are 90% made for the balance of our 120 odd xmas cards. A bit of stamping, colouring and attach our handmade stickers to the back and I will be done. Hope you like them. I am quietly in love with every one. 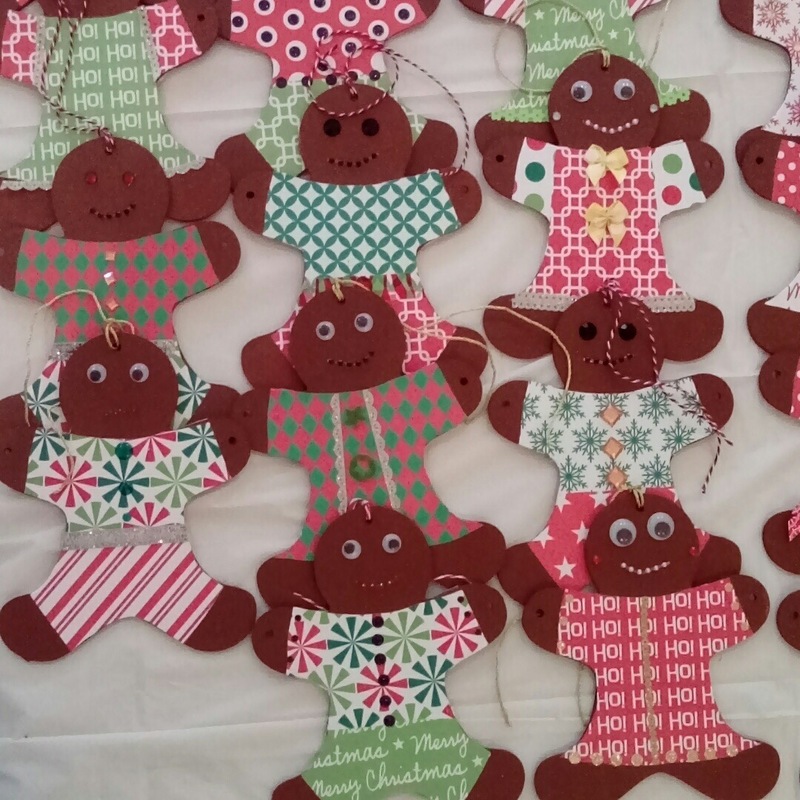 So today was the day, I had base coated the remaining 38 gingerbread, cut 80 sets of clothes (3 goes to get the design right so I could use the cricut to cut out, still needed a small trim as I went but much easier than doing all by hand), raided the stash for ribbon, bling, buttons and anytng else we could use for decoration. I ended up using a glue stick rather than the xyron after some advice from a friend to attach the clothes and pressed flat with my bone folder. It took mum and I about 5 hours to dress and bling all of them. Great to do a far bit of destashing. They are all resting in a box until they are gifted to the lucky recipients safely layered with greaseproof. Not what we had actually planned to do today but pleased to get this job done. So earlier this year I took my bestie along to a cosmetic and soap making course. 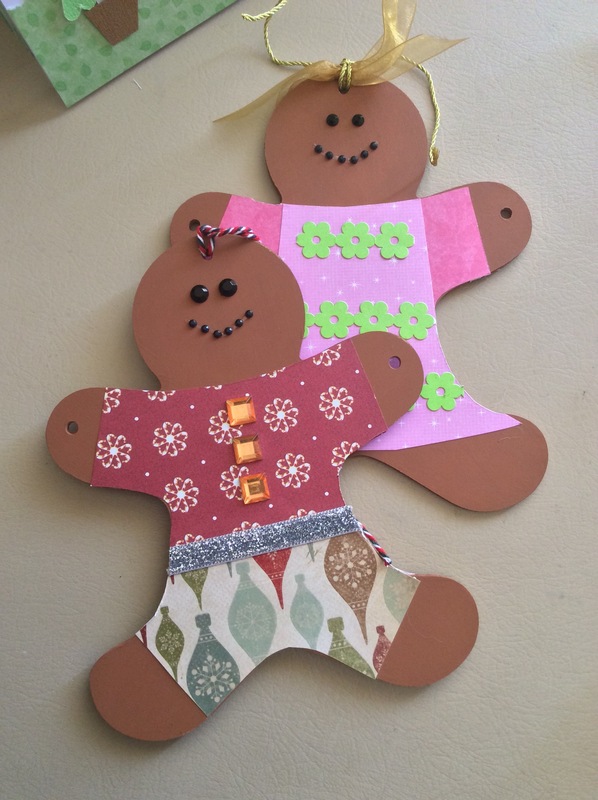 Both of us love handmade things – making and using. We have made two batches of soap thus far and it is better to do in pairs so you don’t forget anything. But as I am currently not working and she is I have been experimenting with a few other beauty items – lotion bars, body scrubs and lip balms. Dr Google is great for finding different idea’s of how to do this. Here are the ones I have selected for 3 things, simple clear instructions, minimal ingredients and one pot makes. Lotion Bars – my favourite is to use beeswax, olive oil and coconut oil and put into either ice-trays (plain or shaped) or mini muffin tins (don’t worry they pop out once cooled). Ice-cube ones can be stacked in a glass jar and the mini muffins fit into those little plastic one serve sauce containers you can buy at the supermarket. If you remember add some essential oil I have found around 12 drops per batch is about right. Body scrubs – I find sugar great, doesn’t sting after shaving and disappears down the drain instead of remaining on the shower floor. You can reuse your old containers or buy some new at the cheap/thrift shop or when you buy the ingredients from a speciality store. Best of all these are not expensive to make and can be made at the last minute if needed! In September I pull out my christmas craft box – this has the carried forward craft items, U.F.O’s and any items I have bought on sale post christmas to make up for this year. It also contains fronts of christmas cards saved from last year (I am also gifted these by family and friends). So what do I do with these? 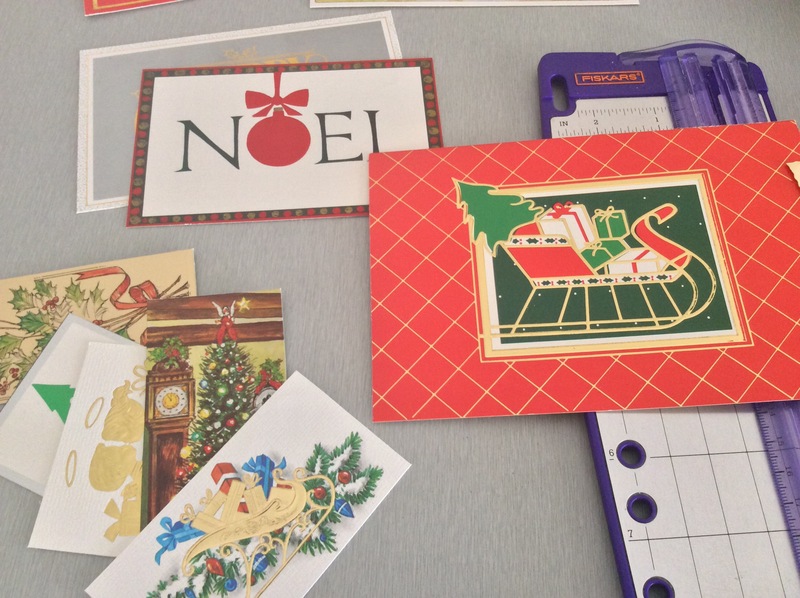 Post christmas I toss any damaged, marked, not my style type cards. The rest I rip apart and keep the fronts. I then look at these in September and look at which ones can be upcycled – framed designs are good, small ones can be used on cards as an element and bigger ones on gift bags. This I find is best done with a cup of tea, a small guillotine, a recycle bin at the ready and a big pair of scissors. And, the craft box, well that will be another post but I am happy with what is in it. Those will be future posts! My mum tells me I used to love Bill and Ben the flower pot men which may explain my fascination with all flower pot dolls. This cutie is a fashioned from a painted upturned flower pot (red and then glittered), a large wooden ball, 4 small balls for the hands and feet, cord, curly hair, a small santa hat and some decorations. Start by painting the pot your desired colour. Once dry give a quick coat of varnish. Work out the appropriate length to cut the cord for the arms and legs by draping over the pot. Sorry it is not a precise science. Tie a knot in one end and thread on your beads. The cord for the arms is tied around the cord for the legs to anchor. Glue on the curly hair, some eyes and draw on a mouth. Glue on the Santa hat and then decorate as desired. I’ve used pom poms for buttons, the brim and top of the hat. You can turn this into an angel by painting the pot gold, adding bow twisted at the middle (use wire-edged ribbon) for the wings and leaving out the santa hat. Well I actually made this in October for my mum’s birthday so haven’t been able to post it in case she saw it. A few years ago I made a bauble tree its core, a foam cone has now disintegrated and as a result the poor tree collapsed. The cheap plastic balls also were starting to show their age. Mum asked me to refurb the tree but I had a better idea, make a new one with modern colours (pink, purple, blue, green etc) for her birthday. The result it pretty good. To make, start with a small pot or bucket, add oasis core to fill the pot. If you want a nice symmetrical tree you should also add a cone insert however I recommend spray painting either gold or silver before inserting. This is so if you can see it between the balls it doesn’t stand out. Then starting from the bottom start gluing the balls around the tree. At the top add your choice of decoration. I decided on a star but as my tree is also a bit “organic” I also added a couple of cute decorations and some pink ribbon. To finish off I purchased some “diamonte” stick on letters to spell Joy.